If you are looking for customising your website SEO by using SEO Tab of “Elegant Themes” then this article can provide a great help. In this article, we are going to explain about how we can define Meta tag, Meta description, Meta title and Meta keywords using SEO Tab. SEO Tab contains three sub tabs as “Homepage SEO”, “Single Post Page SEO” and “Index Page SEO”. In this step, we are going to customise and briefly describe the different options of “Homepage SEO” sub Tab. The first option available here is “Enable Custom Title”, we can enable this option if we want to set Custom title for our site homepage, Otherwise if this option is not enabled, then by default the title will be the combination of blog name and blog description. Then after this next options are “meta description” and “meta keywords”, we can enable these options if we want to set custom description and custom keywords for our site homepage. Now moving to the next sub-tab of SEO Tab, which is “Single Post Page SEO”, In this tab we have the options as “Enable Custom Title”, “Enable Custom Description”, “Enable Custom” and “Enable Canonical URL’s” for a single post or page, we need to enable them if we want to set custom title, custom keyword and meta description for each of the page or post. On scrolling down we get an option as “Custom Field Name to be used for title”,“Custom Field Name to be used for description” and “Custom Field Name to be used for keywords”, we can use these fields for defining title, description and keyword for each of post or page. 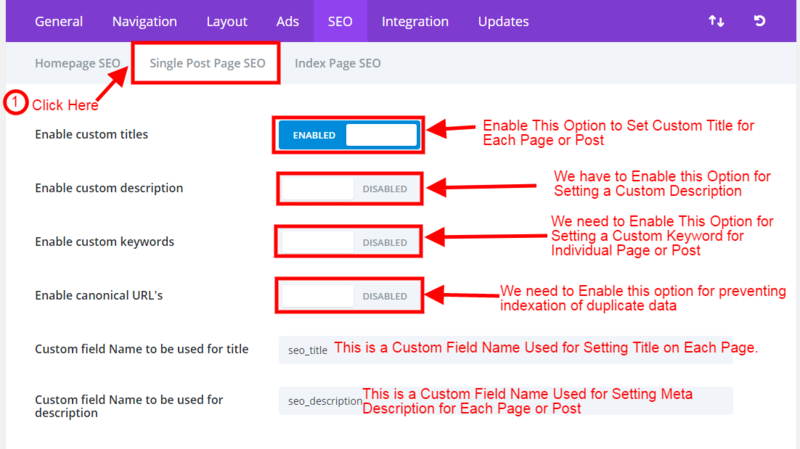 After this we get options for setting “Method for Auto-Generation method for title” and “Character to separate the blog name and Post Title”, if we had already disabled “Custom Title” option, both of these options helps us to choose how the individual post or page title generated. Now moving to the last sub-tab of “SEO” Tab, here in this sub-tab, we can see the option for enabling or disabling the “Canonical URL’s”, if we enable the “Enable canonical URL’s” option then it is very much helpful in preventing duplicate content to be indexed, as we have described above, but it does this only for indexed pages. After this another option is of enabling or disabling “Meta Description”, if we enable it then we can display meta description for archives and categories, and this meta description is one which we have mention while editing or creating category or archive in wp-admin.On scrolling a bit more we can see the next options as “Choose title autogeneration method”, we can choose the method for auto-generated title as well as we can also choose the character which separates “Blog name” and “Post Title”, this title works, if we have disabled “Custom Title” option. Now in this part, we are going to describe how we can set Custom Title, Custom Description and Custom Keyword for a post or page. For this, we need to click on “Edit” post or page and then look for the “Custom Fields” option. Whenever we want to add custom fields at first time on any page or post then we can add Custom Title, Custom Description and Custom Keyword for a Page or Post by using these options as shown in the below image. And then if we want to add custom fields to the next page, then we can add the custom fields on the first page we can directly select them from the drop-down menu as shown in the below image. We can also add any of the new custom fields on the second page using the “ADD Custom Field”. Please refer the below image for more. We hope that this article will be quite useful for improving your site SEO by using the default SEO features of “Divi” theme if you still face any trouble you can write your query and you can also suggest your valuable suggestion and feedbacks. Please subscribe for latest Updates. I enabled SEO and added Keywords and Description for one test page and one test post. I had the same problem. What the poster didn’t explain was that in your page’s Custom Field name, you have to use the exact same description/keyword name you defined in the DIVI Page SEO options. What I originally did was use the name ‘description’ + ‘keywords’ , but that didn’t trigger DIVI to publish the metatags. I’m guessing you did the same. Thank for this article it was most helpful. Can you please advise how I can test that all my seo information works. Thank you in advance.